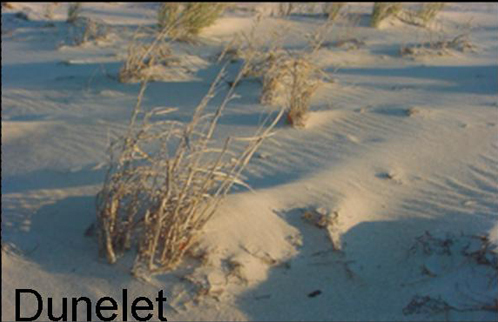 The General Assembly enacted the Coastal Primary Sand Dune Protection Act (The Dune Act) in 1980, which covered nine Virginia Tidewater localities. The Dune Act was originally codified in Code § 62.1-13.21 to -13.28 and later recodified as Coastal Primary Sand Dunes and Beaches in Code § 28.2-1400 to -1420. 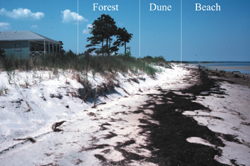 In 2008, the Virginia General Assembly extended protection to all Tidewater dunes and beaches. 2. Morphology: landward and lateral limits are marked by a change in grade from >10% to <10%. 1. Substance: zone comprised of unconsolidated sandy material upon which there is a mutual interaction of the forces of erosion, sediment transport and deposition that extent from the low water line landward. 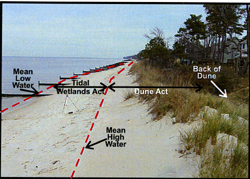 a.Low water line landward limits are marked by change in material composion such as dune, bluff, marsh or woody vegetation. b.If no change is marked then the landward limit of the beach is defined by the nearest impermeable manmade structure, such as bulkhead, revetment, or paved road.